Last week at the Wisconsin Real Estate Trends Conference, we were honored to have R. Scott Dennis, CEO of Invesco Real Estate, and Jody Thornton, Executive Managing Director of HFF, headline an impressive panel right before lunch. 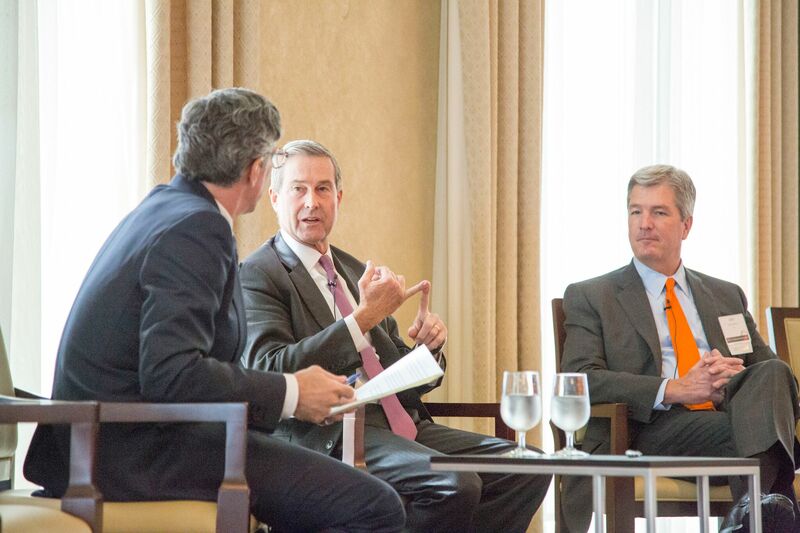 The session was moderated by Jeffrey Bramson, Senior Managing Director at HFF, and focused on the lessons Mr. Dennis and Mr. Thornton have learned throughout their distinguished careers as leaders in the industry. Classmates and fellow graduates of the University of Texas at Austin, Mr. Dennis and Mr. Thornton have nearly 70 years of combined experience in commercial real estate, both having long tenures at their respective firms. They provided unique insights and outlooks for the future of institutional investment in real estate, specifically talking about the consolidation of money managers, impact of unfunded pension liabilities on the industry, and reduction in leverage amongst institutional investors. Their nuanced perspectives were well-received by the crowd, and prompted lots of questions towards the end of the session. A key theme both men focused on was the importance of people, relationships, and teams in the industry, especially as a leader. Technical ability and industry knowledge is certainly crucial, they explained, but, as a leader, focusing on developing and investing in your people is paramount to success. Their message resonated with the Badgers and UW friends in the crowd, all of whom attended the conference to reconnect with former classmates or colleagues, create new relationships, and share in the collective spirit that embodies Wisconsin Real Estate. We’d like to thank Mr. Dennis and Mr. Thornton for taking the time to share their wisdom and expertise and we hope to see them again soon! The Dianne M. Orbison Memorial Real Estate Scholarship Award fund was established by the Wisconsin Real Estate Alumni Association thanks to the generous contributions of her family and so many classmates and friends of Dianne’s who expressed strong wishes to honor her memory as a loving person, good friend and strong leader. Dianne is remembered for her collaborative approach in business, as a volunteer and advocate for the University of Wisconsin, and as a person who was a barrier breaker. This scholarship award is intended to serve as an inspiration to undergraduates, graduate students and alumni of the real estate program as they pursue the fulfillment of their personal and career goals. 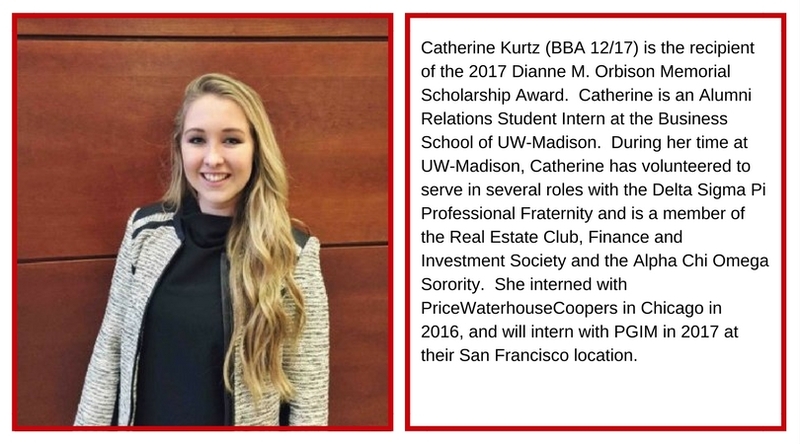 The Wisconsin Real Estate Alumni Association is proud to continue the tradition of this important scholarship begun by Dianne, one of the many ways she found of "giving back". Criteria considered in making this scholarship award includes community service, enterprise management skills, leadership, curiosity, love of learning, sense of humor, common sense, and ability to rise to a challenge. 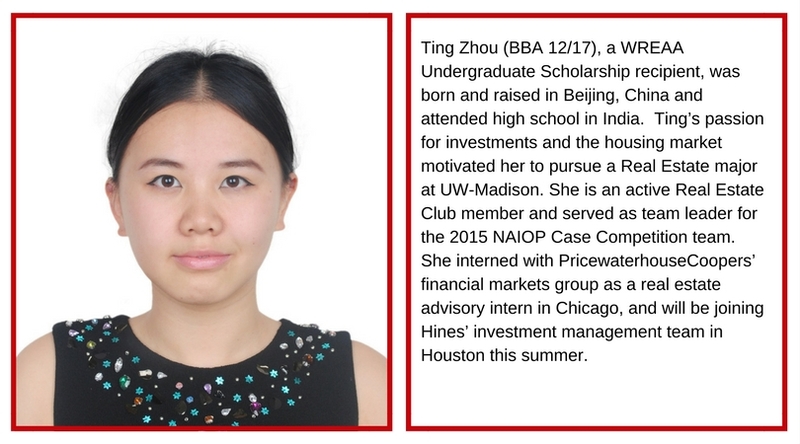 The scholarship is awarded to a female graduate or undergraduate real estate students. 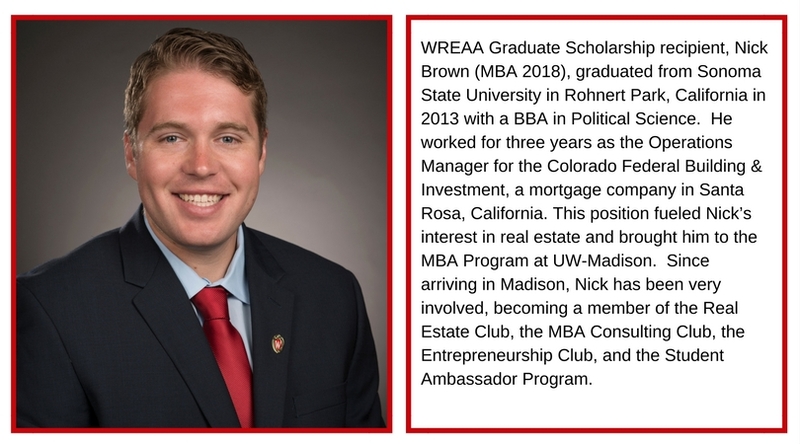 In addition to providing alumni and affiliate members with numerous networking, business development, and professional development opportunities, the WREAA also provides financial resources for student scholarships for the UW Madison Real Estate Program. Generous donations made to the alumni association by dedicated alumni and friends make possible the allocation of funding for these scholarships. 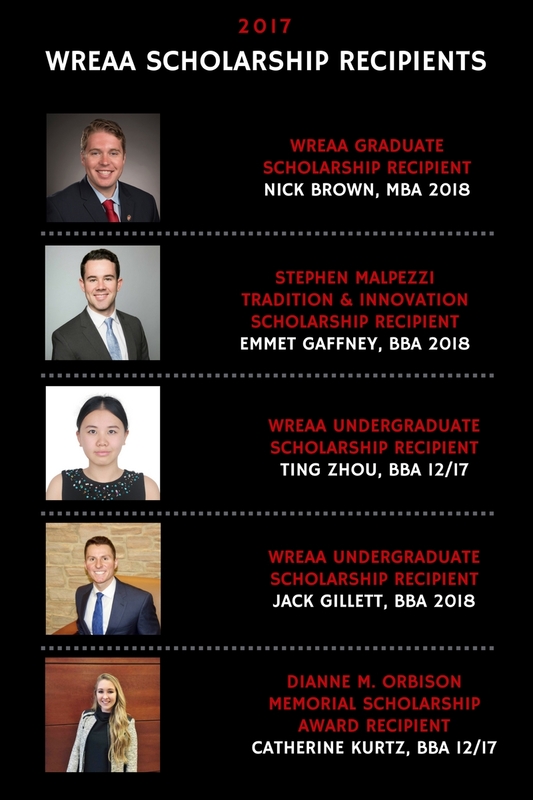 WREAA was able to provide one $5,000 Scholarship to a graduate student, and two $2,000 scholarships to undergraduate students in 2017. The Tradition and Innovation Scholarship is awarded in recognition of the long-standing service and dedication of Real Estate Professor Stephen Malpezzi, who retired in 2016 from his teaching role at the University of Wisconsin-Madison. Applicants for the $5,000 scholarship were asked to write an essay answering the question "How will the Wisconsin Tradition in Real Estate Education impact your approach to your career and life following graduation?" 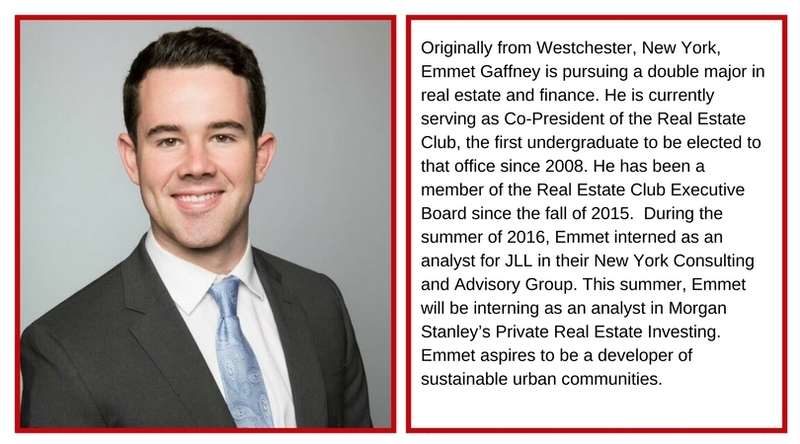 Emmet Gaffney, (BBA 2018) is the 2017 the recipient of the Tradition and Innovation Scholarship. 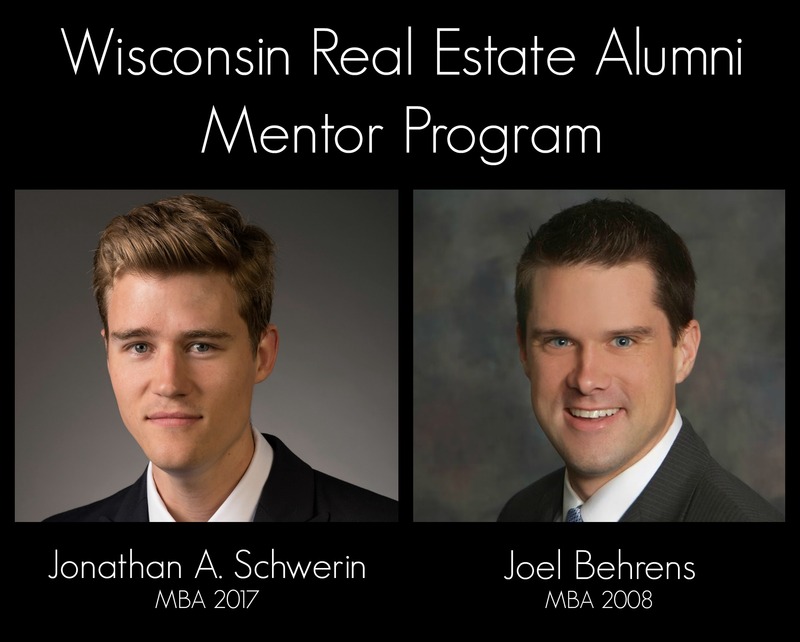 In this feature, Emmet Gaffney interviewed graduate student Jonathan Schwerin (MBA 2017) about himself and his participation in the Wisconsin Real Estate Alumni Mentor Program. For further information about the program contact Sharon McCabe. Q: What was your previous experience before coming to get your MBA and how did it lead you to deciding to major in real estate? A: My previous career was as an equity analyst and securities trader for a boutique buy-side asset management company. I specifically worked on a Micro Cap fund (<$500MM market cap) as a generalist on the team. What I found is that I was expected to know so many different things about so many different sectors of investments, such as industrials, energy, consumer staples, healthcare, etc. and I didn’t truly understand the underlying fundamentals of each of those sectors. My attention was getting pulled in too many different directions to truly become an expert on any of those investments. So instead, I wanted to focus on one sector of investments and real estate is what interested me the most. Moreover, I wanted to shift away from the public equity side of things and into the private side where I would be able to create value on the inside of a company instead of sitting on the outside looking in to a company and betting on management teams to execute. I really wanted to gain more control of the process when it comes down to it. Q: Did you have an internship last summer? A: Yes, I worked at STRS Ohio in their San Francisco office over the summer as part of the acquisitions team. The bulk of my internship was spent working on a multifamily development deal in San Francisco where we partnered with a major California developer and our equity exposure was in the form of a letter of credit. The rest of my time was spent underwriting other potential investments. For example, I created an ARGUS model for a potential high street retail acquisition in Los Angeles, a shopping center in West Los Angeles, and an industrial property in Anaheim. The combined total value of those prospective investments was over $250MM. Q: I noticed you’re a part of the Wisconsin Real Estate Alumni Mentor Program program. Who’s your mentor? Q: What influenced you to become a mentee? A: I wanted to become a mentee for three reasons. First, I wanted to have somebody I could contact in the industry and ask all the basic questions I wouldn’t normally ask real estate professionals. Second, I wanted to have someone in the industry to bounce ideas off of, whether that was career related or market related. Lastly, I wanted to get some lessons learned from someone who was in my shoes just a few years ago. Q: Have you met your mentor in person? If so, can you tell us about it? A: Yes, Joel and I met when I was in Dallas for a ULI conference. Joel lives and works in Dallas and is a very prominent developer for Trammell Crow. He took me to a few of the projects he was working on while I was down there. It was great to see some of his projects and ask him questions on how everything came together. What was really cool to see was the different phases each project was in. For example, one of his projects was just getting out of the ground while another was nearing completion. We also talked at length about the Dallas market and the flood of people that were moving to the area. On Thursday, April 13th, Real Estate Club met at the Pyle Center overlooking the Lake Mendota sunset. Those in attendance enjoyed pizza, beverages, and conversations amongst faculty and students before the meeting finally got going. Alumnus Rob Korslin was on hand to speak to the Club. Mr. Korslin graduated from the UW with a BBA in 2011, then immediately moved on to complete an MBA, graduating in 2013. While at UW, Mr. Korslin was a tight end for the football team during his undergraduate years and a Real Estate Club President during his graduate years. Since completing his real estate education, Mr. Korslin has worked for Goldman Sachs, JP Morgan and, most recently, KKR where he currently works doing private equity real estate. During his time at KKR, Mr. Korslin has structured and negotiated myriad deals with a strong focus on midcap transaction sizes and under the radar opportunities located in gateway markets. The presentation was focused on structuring the financing of deals, specifically how the timing and predictability of cash flow determine financing success. KKR’s strategy is to buy complexity and sell simplicity. In illustrating his points, Mr. Korslin brought the group through a case study of an office building in Washington, DC. After the meeting, the group went over to the KK to enjoy a first-round on the club! The next meeting will be on April 27th and will feature Mike Slavish of Madison-based Hovde Properties. Please don’t hesitate to reach out to Emmet Gaffney or Ben Stevens with any questions about the club! Congratulations to all of the recipients and many thanks to the dedicated alumni and friends who served on the scholarship committees! This past Thursday, March 30th the Real Estate Club invited D.C. based developer Martin Ditto of Ditto Residential to come speak to the club. In just the past seven years, Ditto Residential has grown from just Mr. Ditto to 15 employees and has become one of D.C.’s best-known boutique developers, noted for partnerships with high-end architects and designers. 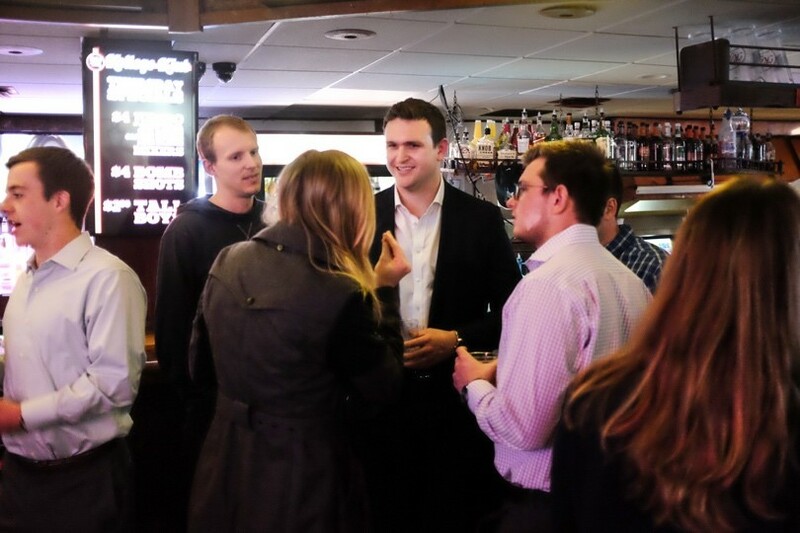 Many students arrive early to the Pyle Center to enjoy pizza, beer, and the company of their peers. Undergraduates and graduates mingled with each other and the speakers, before the meeting finally got underway. Co-Presidents Emmet Gaffney (BBA ’18) and Ben Stevens (MBA ’17) began by updating the club about the upcoming event about architecture and the bottom line, the upcoming “Pro-Form Off” competition, and the upcoming community service event at the UW-Madison Arboretum. Mr. Ditto received his bachelor’s degree at Vanderbilt University then went on to pursue his master’s degree in real estate development at Johns Hopkins University. In autobiographical style, Mr. Ditto walked the students through the story of how his life experiences led him to becoming a real estate professional, with a particular emphasis on the qualities he believes are essential to his success in the industry. His firm is known to be one of the leaders in branding of real estate – many architects and designers brand themselves, he explained, though it’s much less common for real estate firms to do so. Though not an alumnus of the University of Wisconsin, Mr. Ditto exhibited the attention to detail and passion for the industry inherent in most real estate Badgers. The next meeting will be on April 13th and will feature alumnus Rob Korslin of the New York based private equity firm KKR. Please don’t hesitate to reach out to Emmet Gaffney or Ben Stevens with any questions about the club! Ben serves as the current co-president of the Real Estate Club. Q: What year are you and where are you from? Q: Tell me about your experiences prior to coming to the UW. A: Before coming to school, I studied German Language and Literature and then did a master’s in theology, after which I spent five years teaching theology in Germany. Friendships with a couple of Berlin’s leading architects and urban planners got me interested in the built environment. When I finally decided to get involved in that field in some capacity, the real estate side of the equation, and specifically an MBA in Wisconsin’s historic real estate program, seemed like the best place to get started. Q: Have you had any RE work experience since being in school? A: Since coming to the program, I’ve interned with a Madison developer who is transforming the East Washington (TIF district) corridor. My role with his firm involved everything from doing pro-forma analysis of a new development he was considering, writing an offering memo to obtain financing for a development which had just been entitled, assisting the project manager with the final phases of construction of a large, mixed-use building, and working with brokers to consider tenants we were vetting for several commercial spaces. I am currently assisting an owner’s rep in another firm with the pre-con phase of a different large, master-planned development on East Wash.
Q: What have been the highlights of your time in the program? A: My coursework has given me a broad foundation, and participation in events like the Austin case competition proved both grueling and rewarding, but our traveling and networking probably stand out as the greatest highlight of the program. For school trips and job interviewing in the past year alone, I have spent time in New York, Washington, DC., Raleigh-Durham, Charlotte, Atlanta, Dallas, Austin, Chicago, Seattle, and Cannes, France. Almost every trip has involved meet-ups with alumni who were able to give us a crash course in the local market, and I’ve found myself more impressed with the breadth of the alumni organization (WREAA) with every trip. Additionally, last semester I (as a graduate student) decided to team up with an undergraduate I had met to run for club president. Unlike the real estate clubs at other schools, our club brings the undergraduates and graduates together. The partnership has been a highlight of my time at school and has, I believe, helped us knit our graduate and undergraduate community together even more. We have instituted an undergraduate trip scholarship, helped make updates to the graduate lounge, launch a new club website, and spearhead a cooperative project with the alumni network. Q: Do you have any plans for after graduation? A: Going forward, my wife and I are hoping to find an opportunity to move to the Carolinas, or somewhere in the mid-Atlantic region, where I hope to eventually open my own development firm. In the short-term, though, there’s still a lot to learn and I’m exploring a few different options. A: I spend my free time with my wife Rebecca and son Elijah, and what little extra free time I have left after that is spent on my interview show, The Skyline Forum. 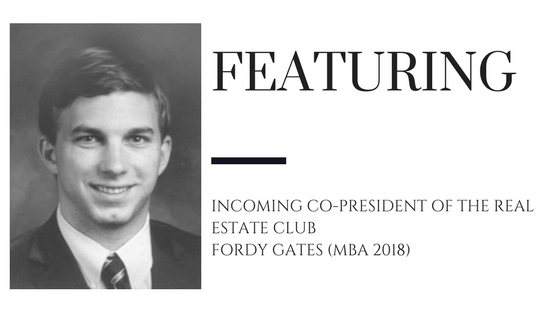 John "Fordy" Gates will serve as Co-President of the Real Estate Club during the 2017 Fall semester. A: I’m in the MBA Class of 2018 and I’m originally from Chicago. Q: Tell me about your experience in Real Estate prior to coming to UW. A: Prior to commencing my MBA studies, I spent four years in the real estate service industry. I began my professional career at CBRE in the Market Research Group in Dallas, TX, where I was in charge of compiling the Dallas/Fort-Worth industrial market overview and generating quarterly market write-ups. At CBRE I created a database of 100 top industrial leases which was used to compare the largest leases signed year-over-year in the Dallas/Fort-Worth area. After CBRE, I moved to New York City, where I became JLL’s head research analyst for 63.7 million square feet of office property located in the Midtown South office sector within New York City. While with JLL in New York, I launched the JLL New York City monthly high-tech report, designed and developed first Flatiron district information graphic, initiated JLL New York daily news email and provide market analysis for the office capital market team in disposition and recapitalization deals. In June 2014, I was transferred to JLL Industrial Investment Sales Group in Chicago, IL, where my responsibilities included asset disposition and financing services to all capital markets clients focused on industrial assets. I was integrally involved in all aspects of the pre-marketing, due diligence, underwriting and offering materials production processes for institutional and corporate clients as well as private owners of real estate. Q: What have been your favorite Real Estate class so far? A: Real Estate Finance and Argus modeling, taught by Arif Qureshi. Q: Have you been involved in any Real Estate school projects so far? A: Not yet, but I’m looking forward to participating in case competitions in the future. Q: What are you most looking forward to during your time in the Real Estate program? A: I’m looking forward to competing in real estate case competitions around the country, meeting and networking with people within the real estate industry and attending MIPIM next year. Q: Are you a member of WREAA? If so, how has your membership benefited you? A: Yes, I’m a member. I am in the mentorship program as a mentee. My mentor is Stew Cedarleaf who does acquisitions and dispositions for Prologis. He’s been a great resource to me so far. Q: Tell me about what you’re most excited to accomplish as Co-President of the club. A: I am excited to use my extended network of real estate professionals to help bring exciting speakers to campus for the club. Q: What do you do when you’re not focused on Real Estate? Do you have any hobbies? A: In my free timed I enjoy playing hockey, golf and traveling. A: Scar Tissue by Anthony Kiedis, the lead vocalist for the Red Hot Chili Peppers. It’s his autobiography. Q: What’s your favorite city? Where do you want to work after graduating? A: After living in different parts of the country, I’d have to say my favorite city is Chicago and it’s where I plan to live after school. Q: What business line within Real Estate do you think you want to go into? A: Dock doors, clear heights, and truck courts have been part of my vocabulary ever since my father started Centerpoint Properties. I plan on following in his footsteps by getting into industrial real estate after I get out of school. After debating between many different cities, Real Estate Club Co-Presidents Emmet Gaffney (BBA ’18) and Ben Stevens (MBA ’17) decided to choose Seattle as the destination for this semester’s Real Estate Club trip. After having a great experience in Atlanta last semester, the two knew they had big shoes to fill. Known for its walkable urban landscape, the two decided Seattle would provide nice juxtaposition to the car-centric nature of Atlanta. Additionally, Seattle currently houses the most cranes out of any city in the United States, meaning there would be plenty of great projects to see. In December, Emmet and Ben started networking with a loyal group of Seattle Alumni, led by Greg Van Patten (BBA ’93). After countless phone calls and incredible diligence on the part of the Badger alumni, the itinerary was eventually finalized a few weeks before the trip. The Real Estate Club arrived on Wednesday night and were warmly welcomed with an evening reception at the rooftop bar of the Thompson Hotel sponsored by Tom Craig (MS ’93). The venue featured striking views of the Elliot Bay and the Seattle Skyline. On Thursday morning, the club began their tours bright and early with a market overview hosted by JLL, the Downtown Seattle Association, and VSA Architects. After the overview, the club went on a tour of Amazon’s Global HQ led by their Director of Global Real Estate and then a construction tour of the luxury apartment building, Arc Tower, led by Dan Lessor (MBA ’10). The club broke for lunch at a delicious Thai restaurant downtown, then got back to it with a tour of the creatively repositioned office building, Second and Seneca, led by Matt Simo (BBA ’04), and a construction tour of the luxury office building, The Mark. Thursday night’s festivities took place on a cruise ship that set sail for Elliot Bay. With breathtaking views of the Seattle skyline as their backdrop, students and alumni talked the night away over dinner and drinks. The cruise, which was generously sponsored by WREAA, was a great way to cap off a full day of tours. As a gift for their generosity in setting up the trip, Emmet and Ben gifted each of the alumnus Real Estate Club apparel and, to help them remember their time at the UW, individual 6-packs of Spotted Cow beer. On Friday morning, the club wrapped up their experience by visiting two projects in the Capitol Hill area of town. The first tour was of Pike Motorworks, a mixed-use, rehab project, led by Greg Van Patten, and the second tour was of 12th Avenue Arts, an affordable housing property designed for artists, led by Brad Lange (MS ’90) and Lisa Hagen (BBA ’05). Be sure to check out the video recap put together by the Real Estate Club to see some great photo and video! Thanks to all of the faithful Badger Alumnus / WREAA members in Seattle for helping make this trip possible! Grady Capobianco will serve during the 2017 Fall semester as Co-President of the Real Estate Club. Stay tuned for another installment of the Student Spotlight featuring Fordy Gates, the second Co-President serving in the fall. A: I’m in the MBA Class of 2018 and I’m originally from Boston. A: I Interned for medical/academic focused brokerage group at Cushman & Wakefield of Boston while in undergrad at Tufts University. After graduation I worked for construction manager cm&b, inc. in Massachusetts for 4 and a half years. I spent time as estimator, superintendent, and most recently a project manager for the past 3 years. I built commercial properties across New England, New York State, New Jersey, and Manhattan. A: Real Estate Finance was a great introduction to the industry and financial processes that take place daily. Excel modeling, taught by Arif Qureshi, was also a great class. A: I’m currently working on an appraisal project for a local property in Madison in Joe Walsh’s Techniques in RE Valuation class. A: Yes, I’m a member. Every alumnus I’ve spoken to has been amazing about giving up time in their busy schedule to connect with me, whether it be a mock interview or just an introduction or networking connection. 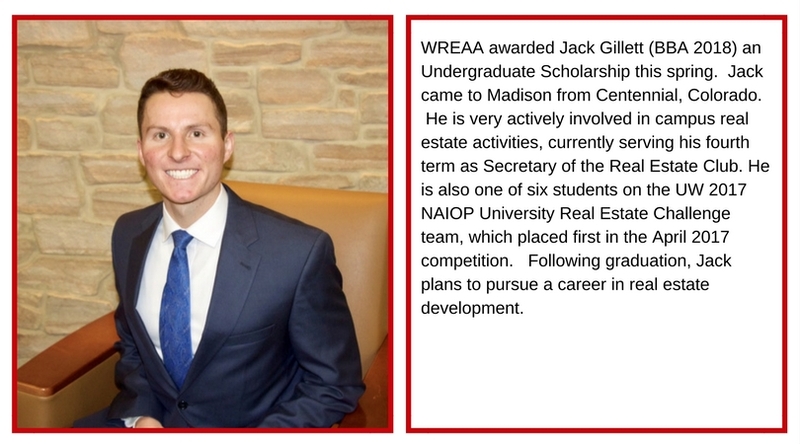 A: Establishing lifelong relationships amongst all members of the club so that every member continues the great tradition of being a helpful and interconnected Wisconsin Real Estate Alumnus. A: I enjoy fishing, boating, sports, watching the Pats and Red Sox, staying active, and spending time with friends/family. A: I have too many favorite movies to choose just one. Happy Gilmore and Old School are up there. A: Boston will always be my favorite city. But I am hoping to experience working elsewhere for some time after my MBA. I really enjoy Chicago and Austin.